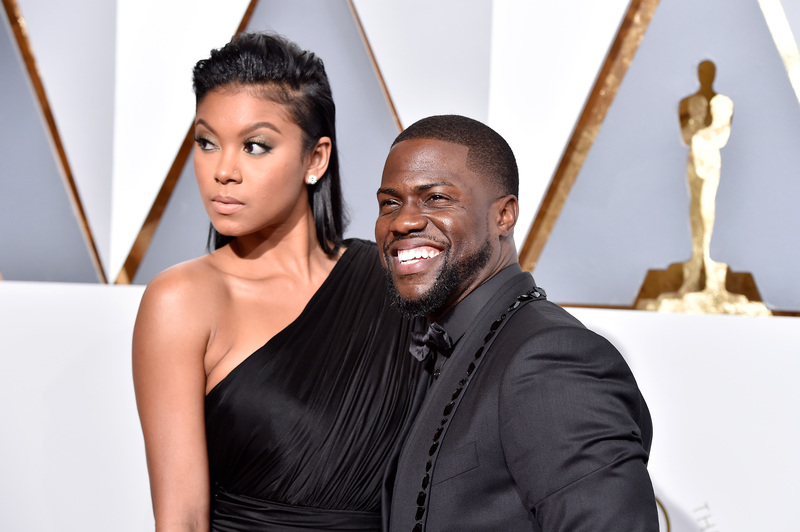 Kevin Hart is pushing back after his ex-wife, Torrei Hart, claimed that the comedian cheated on her during their marriage with his new wife, Eniko Parrish. He posted an Instagram Story video addressing the feud between his wife and ex-wife and said, "All I do is laugh, man." It started on Aug. 13, when Parrish posted a photo on Instagram of her wedding with Hart for their one-year anniversary. She wrote, "8 years together..1 year married..Forever to go!" Her followers quickly pointed out that Kevin and Torrei Hart got divorced six years ago, but Parrish defended herself and said the couple were already separated by then and that Torrei Hart tries to act like a "victim." Torrei Hart and Parrish then argued in the now-deleted comments on the post, with Torrei Hart insisting, "You, Kevin and I know the truth." Torrei Hart also told TMZ, "Numbers don't lie. Dates don't lie." Kevin Hart defended Parrish and said, "Going to be honest with you people, I'm at a point where I can't even be shocked anymore. All I do is laugh man." In another clip, he said, "Even after writing a book, a very good book, about my life in great detail … still not enough?" His fans might learn more later. He said at the end of his videos, "This will act as nothing but material for your boy."